There’s something quite beautiful about the sight of a single balloon disappearing off into the sky. It’s even more impressive when that balloon is one of many heading straight for the clouds. It might look good, but there are serious environmental and wildlife risks to this popular tradition. Many parents choose to release balloons at christenings or birthday parties, thinking it will make the perfect photo opportunity. However, when the balloons come back down to earth, the scenes are less inspiring. 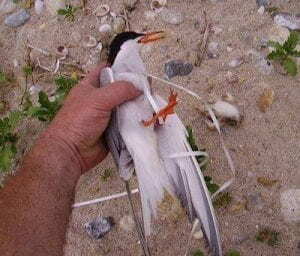 Sadly, each year many animals are injured as a direct result of balloon releases. It takes only a single balloon to injure or cause the death of an animal. Balloon releases might look good, but many are starting to question whether they’re really worth it. You probably wouldn’t drop litter on the street, so why would you drop litter in the sky? Those balloons have to come back down to earth eventually, and when they do, it’s highly unlikely they’re going to land in a rubbish bin. Most likely, they will end up in the ocean or the countryside and will cause problems for wildlife. An endangered sea turtle swallowed a balloon. Unfortunately, although there is now increasing awareness of the dangers of balloon releases, there is also an increasing amount of balloon debris found washed up on beaches. 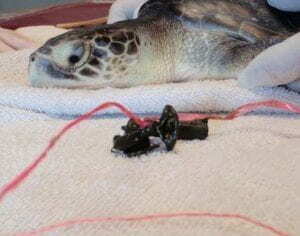 Many animals mistakenly eat balloon debris, thinking it is food. It’s all too common for sea animals to be found with stomachs filled with plastic and other litter. Balloons make up a large proportion of that litter. Balloon debris can block an animal’s gut, causing the animal to die from starvation. Animals can also become tangled in the debris, leaving them unable to move. Even biodegradable balloons take years to decompose and so pose a very real risk to wildlife. A quick Google search will reveal hundreds of images of animals injured or killed because of deflated or popped balloons. It was too late for this entangled bird. Photo credit: Matthew Male. If you’ve decided to join the balloon release boycott, you might be wondering what you can do instead. Well, don’t worry. There are plenty of alternatives. They are equally beautiful, and will allow you to celebrate in style. A living plant – if you want to mark an occasion, planting a garden of flowers or a couple of trees is the perfect way to do it. This is something that can be enjoyed for years to come, and will live on as a permanent reminder of your celebration. It will also be a beautiful backdrop for your photos. Floating flowers – if the release element is the big attraction for you, then floating flowers make a great alternative to balloons. Choose some eye-catching and colourful flowers to be released at your celebration. They will look great and you can enjoy the event safe in the knowledge that you’re not harming any wildlife. Bubbles – kids love bubbles almost as much as they love balloons, so you won’t hear any complaints if you replace a balloon release with a bubble blowing display. Get the kids involved by giving all of them bubble blowers, and ask some of the adults to help out by creating huge bubbles to wow the crowd. Bunting – if you’re looking for a Pinterest-worthy party, bunting is the way to go. You can buy paper bunting cheaply, or,easily make your own with a sewing machine. You can create gorgeous bunting to match your colour scheme and give a vintage-inspired feel to your party. Windmills – if you’re looking for colourful decorations for an outdoor party, windmills could be the perfect alternative. They can easily be stuck into the ground, and will spin whenever the wind blows, creating a beautiful and colourful effect to dazzle your party guests. Paper decorations – if you enjoy crafting, paper decorations will keep you busy for an afternoon, and provide gorgeous decorations for your party. A quick search online will throw up thousands of different techniques you can use to create paper decorations. From tissue paper pom-poms to folded stars and paper garlands, there are lots of different styles to choose from. If you’re not a fan of crafting, you can pick up ready-made decorations online. Will you be joining the boycott of balloon releases? Let us know in the comments below, and please share this message with family and friends. An Australian Change.org petition can be found here. 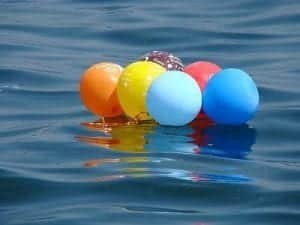 Helium balloons – death traps for birds and sea life. Will you boycott them? Visit Balloons Blow for more information.